There are four factors diamond experts consider when valuing a diamond. They are Cut, Color, Carat Weight and Clarity. These four factors add up to the final cost of your diamond. Which is the most important factor for you to consider? 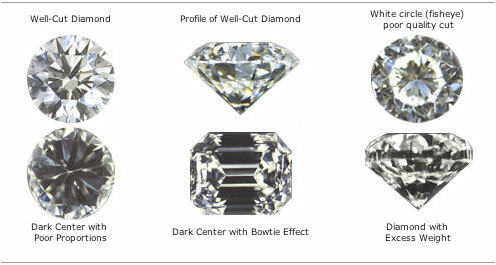 Most experts believe the cut and proportion are the most important factors in determining a diamond's value. They are what give the diamond its sparkle and brilliance. That is why we only sell good or better cut diamonds for all of our diamond engagement rings and wedding rings. We never sell cheap diamonds that have no luster. The brilliant shine from our expertly cut diamonds will add sparkle to your diamond engagement and wedding rings for eternity. Now that you understand what’s most important, you will need to consider the other factors that play a role in the diamond you choose. Remember, the most important factor in purchasing the perfect engagement ring is your own personal preference and taste. Read on and decide what matters most to you and your bride-to-be in diamond engagement and wedding rings. The cut of the diamond can affect its price by as much as 50%. Please take note...cut does not equal shape when speaking about diamonds. A well cut diamond is necessary if you want your diamond engagement rings to have brilliance and sparkle. When we talk about cut, we are talking about the stone's symmetry, proportions and finish. These factors are instrumental to the stone's "brilliance" and "fire." The term "cut" may be exchanged with the term "make" when speaking about a diamond. Need more information before you buy? Read more about diamond cut. Remember, the color of a diamond is not important as long as the person wearing it is happy! Diamond color is graded on a lettered scale from D to Z, D being the least presence of color or the whitest. It is also the most expensive letter grade, because very few diamonds will receive this high grade. Diamonds in the D to J range are all considered colorless or near colorless without any noticeable traces of yellow. Diamonds that are graded K color and darker are less expensive and will begin to show some yellow tinge of color. It is very hard even for a professional to detect the differences in color in the D-F range. This is especially true when the diamond is placed in a setting. If you are looking for more affordable diamond wedding rings consider the fact that diamonds in the D-J range will look even whiter in a white gold or platinum setting, because the whiteness of the diamond is reflected in the white metal and any yellow tint is diminished. Yellower diamonds darker than k will appear whiter in a yellow mounting. The yellow gold color of the engagement ring setting masks the yellow tint of the diamond and makes it look whiter. To ensure that our diamonds are among the best colors, Danforth Diamond does not offer any loose certified diamond below the color grade of J. Want to learn more before you buy? Read more about diamond color. Generally speaking, the higher the carat weight, the greater the per-carat price of the diamond. Carat is a unit of weight not of size. One carat is equal to 100 points or 1/5 of a gram. So if a stone weighs 25 points it is equal to 25/100 of a carat which means ¼ carat. 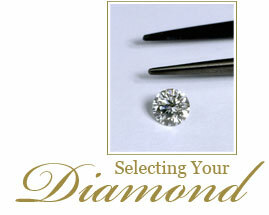 Any diamond you purchase from Danforth Diamond offers the highest quality for the best value. However, a larger carat can mean the difference between affordable engagement rings and more expensive rings. Your budget and styling preferences will help you decide on a diamond wedding ring that has a smaller center stone with several smaller stones on the side or a larger solitaire diamond. Still not sure what engagement ring is right for you? Read more about diamond carat. Always avoid I1, I2, and I3 clarity diamonds for an engagement ring. Diamonds with the above clarity may be cheaper diamonds, but the flaws can be visible to your eye without aid of magnification. In general, it is preferable to purchase engagement ring stones with a clarity grade of SI2 or better. Clarity is the purchasing factor that can be "stretched the farthest" when choosing diamond engagement rings. Most better quality diamonds will have some imperfections, but they are not visible to the unaided or "naked" eye, and are even less noticeable after the stone is set in your mounting. Some may even prefer some flaws as they add personality, character and individuality to your stone. Consider lower qualities for earrings and pendants, which are generally admired from a further distance than diamond engagement rings and wedding rings. Adjusting your clarity can help you find a gorgeous diamond engagement ring that fits your budget. 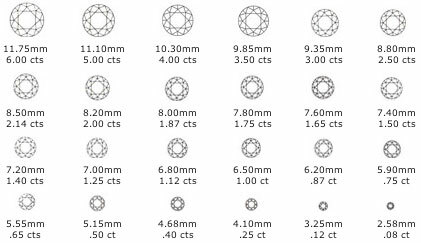 Need a little more information about choosing a diamond? Read more about diamond clarity. Ready to start shopping? View our selection of loose diamonds or browse our collection of diamond engagement rings.